We’ve just returned from our 3 week trip to Bali, Singapore , and Thailand and look forward to sharing with you the details of the trip as well as the cost-cutting techniques we used to make it affordable. Here’s a look at how we spent our week in Bali to help you form your own itinerary to visit this island paradise. As you can see we kind of front-loaded the trip exploring in and around Ubud before heading to Jimbaran Bay in the south of the island to unwind at the Intercontinental Resort Bali. This worked out pretty well because by the time we got to the resort we were worn out. The resort wasn’t very crowded and the beach was practically deserted, which made for a very enjoyable few days. So our total costs for travel and accommodation came out to $439.22. Not bad, considering that’s less than a “good deal” on an economy airplane ticket to Southeast Asia from the United States would cost. By leveraging points and miles we were able to travel better for less. I also find it amusing that we paid less for our nice business class flight into Bali than we did the budget flight out of Bali to Singapore. If this had been the end of our trip and we were returning to the U.S. we would have booked the long haul using points and miles and saved even more (our eventual return flight only cost us $40 each in business class aboard Eva Air—half the cost of the economy Air Asia tickets)! Three nights at the Intercontinental Resort Bali for free! So with a manageable cost for the trip, that freed up plenty in our budget to enjoy our time in Bali. But we ended up not even having to use our entire budget because everything was surprisingly cheaper than we expected! Despite being a very popular destination, Bali is still very much affordable. We knew that it was possible to eat cheaply there, but what surprised us was just how many affordable restaurants there were that served tasty and healthy meals. In fact, it seemed hard to find an expensive meal! For example, hiring a driver for an entire day to take us to the temples around Ubud cost us $45. Our cheapest meal of the week was $5.25 total—that was for two delicious noodle plates, spring rolls and sodas. Our most expensive meal was fresh grilled seafood at Jimbaran beach at sunset—$32 for cocktails, a whole grilled sea bass, whole grilled red snapper, and all the sides. We spent $549 while in Bali, which included the costs for all of our meals, taxis, transfers, guides, souvenirs, and attraction entry fees. That brought the total cost of the trip to $988.22, less than $500 per person. I’m certain we could have shaved even more off the cost if we had been a little more mindful of our expenses without sacrificing the comfort level of the trip. I think getting the trip under $800 would have been very doable, especially if we had used some of the more aggressive tactics that we used for our Turkey, Israel and Jordan trip. Paradise found for just $494 per person. Could you and your S.O. afford a trip like this to Bali? 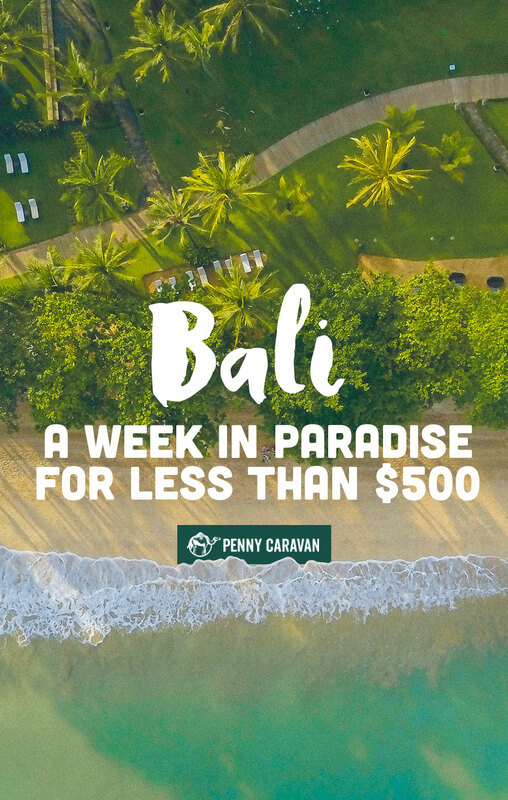 With the right points and miles strategy, you could enjoy a week in paradise setting aside less than $100/mo for a year for your vacation fund. And that’s the all-in price! Comment below if you’re ready to start planning your trip to Bali!